In ‘To Murder Matt’, Matt doesn’t have a very good reputation. In fact he is hated to the point that he inspires murder. ‘To Murder Matt’ is a controversial book that upsets some readers to the point that they can’t even finish it. He is so dark. It’s such a dark book, that will take your mind to places you may never want to go. In ‘Matt – the beginning’, we learn why. Are you ready for him? ‘Matt – the beginning.’ Coming soon. 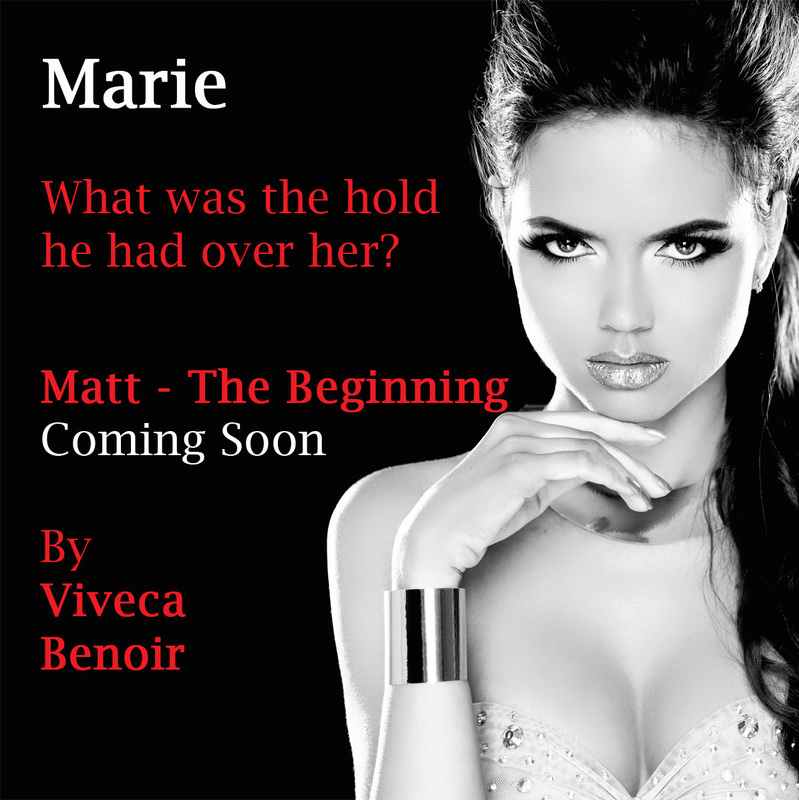 What would you put on the cover of Matt – The Beginning by Viveca Benoir? So the new cover is already in the draft stages for Matt – The Beginning. It’s beautiful… Every cover is a work of Art in itself, where the cover designer brings the book to life so you can see my vision. I always try and leave a review with no storyline hints or spoilers. It’s not easy as you want to spill the beans, you want to talk about the characters, the ‘people’ you identify with and why. You want to highlight your likes and loves, your dislikes and the face palming moments you experienced. the shocks, turns and twists. Really I want to…but I won’t. Read the book yourselves. Make your own mind up as I did mine. So here goes…The problem with a good book (and this is one of them) is that you can’t wait to finish it because you want to find out what happens in the end. And when you do, you are sorry, because now, it’s finished. Carnal Persuasion hooked me in from the first few words and the pages just flew by. I couldn’t read fast enough. Apart from some emotional tears, and trying to carry on and read through them, I very much enjoyed this book. I now have to read ALL of them. Well Done – to both writers. Have you thought of writing your own book? I have to agree with Marie Force. My book, my work, my effort, my tears, so yes – my characters, my story, my rules. Simple message. Go, have the courage to write your own book if you don’t like the book you are reading. Don’t attack the author. Writing your own book will give you such a sense of achievement. Suddenly you will find that you become so appreciative of other writers, their work. You will praise them openly. Only those who have stepped into the flames themselves can understand the effort required to not only follow your dreams, but make them happen. Yet, nothing is stopping others from following their dreams too, only themselves. So put your money where your mouth is – or in this case your fingers to the keyboard and show us what you have got. I will not attack you, but others ‘like you’ may. Can you take the heat?